EMSPROTO wins the “Young Entrepreneur Tribune” Award in Bordeaux! For its sixth step, the 2017 La Tribune Jeune Entrepreneur Award tour stopped in Bordeaux. Five new winners in Industry, Health, New Services, Media & Culture and Start have been nominated. They will face the winners selected in other regions in Paris, March 7, in the final. After Nantes, Lille, Lyon, Marseilles, Toulouse and before Paris, the Award Tribune Jeune Entrepreneur stopped in Bordeaux on Wednesday 25 January. 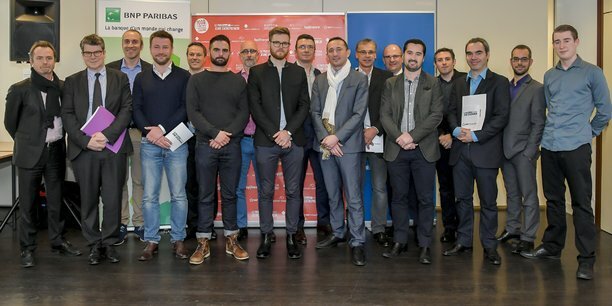 A jury of professionals from La Tribune’s partners BNP Paribas, EDF Entreprises, AG2R La Mondiale, Audecia’s network of chartered accountants and the BPI, brought the Southwest innovation cream to the fore. In the Industry category, 39-year-old Pierre-Yves Sempere hopes to win the big award in the final with his startup EMSProto, of which he is the co-creator. The company is revisiting the prototyping market for electronic boards by offering a new quick assembly service (from 48 to 72 hours) without tools. What satisfy the demand of prototypers, who need flexibility and responsiveness. In a few minutes, the startup’s algorithms can quote the cost of the electronic board and reduce costs. The startup believes that by offering tools to reduce production costs, it encourages companies to keep their production in France.